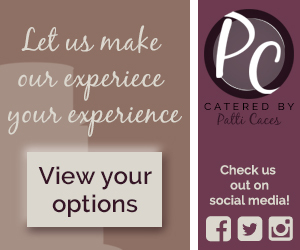 Catered by Patti Caces is a local catering and event planning company based in Orlando, Florida that focuses on one end goal: ensuring that their clients feel taken care of. 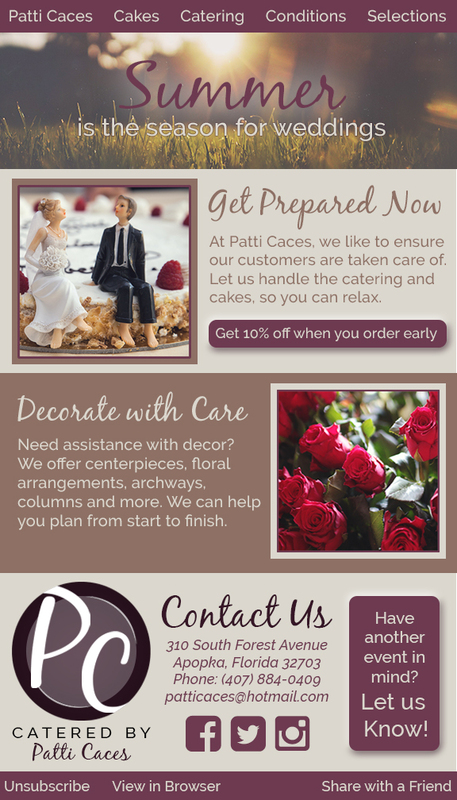 Offering a wide variety of services to their customers beyond basic catering, Patti Caces can provide gourmet cakes, décor provisions, invitations and other planning accommodations. The company has been in business since 1988 and is only continuing to grow: Patti Caces has primarily focused on weddings in the past, but is now expanding into the film production industry, offering both catering and craft services. Although the company has seen success, it lacks cohesive marketing and does not have a visible brand image. This is especially true of the company’s digital communications. Patti Caces currently only utilizes a website and Facebook profile, but they are both outdated and there is no identifiable link between them. The solution to this problem: integrated marketing communications. Integrated marketing communications, or IMC, is the effect of connecting all forms of communication that a company releases to keep branding consistent and recognizable. As this article cites, “by integrating tools such as advertising, direct mail, social media, telemarketing and sales promotion, you provide clarity, consistency and maximum communications impact.” This boils down to helping consumers recognize your brand on every platform. Patti Caces’ main target audience is potential brides and film production companies. This is the audience I have kept in mind throughout the process of creating my IMC plan. One of the initial major problems that I found as I began my planning was that the company uses several different names, including “Catered by Patti Caces” and “Patti Caces (Catering Cakes, and So Much More),” which can cause some mix-ups for potential consumers. I decided to use “Catered by Patti Caces” across all of my communications. 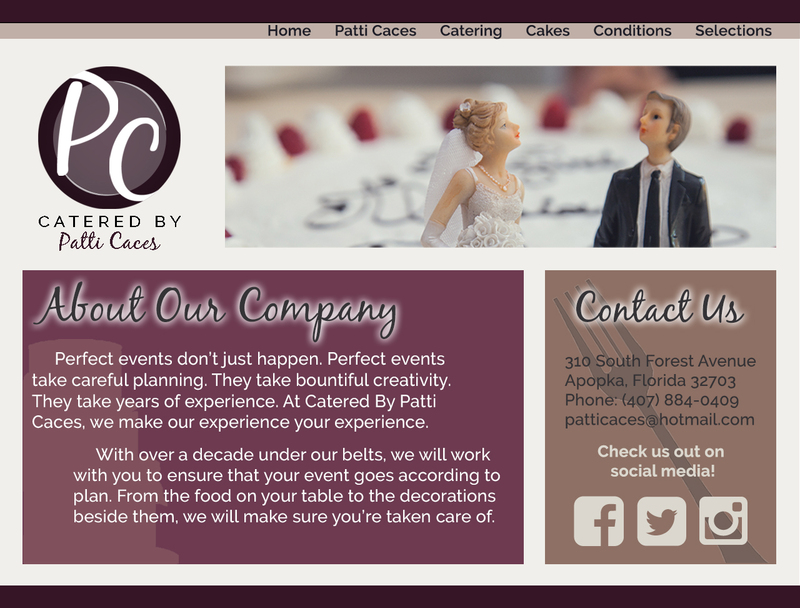 This name does not limit the company, and it can be used as Patti Caces pushes further into the film industry while also maintaining their presence as a top wedding catering company. A second large part of branding and IMC is positioning. Positioning sets your brand apart by associating it with certain characteristics to set it aside from competitors in the minds of the consumer. 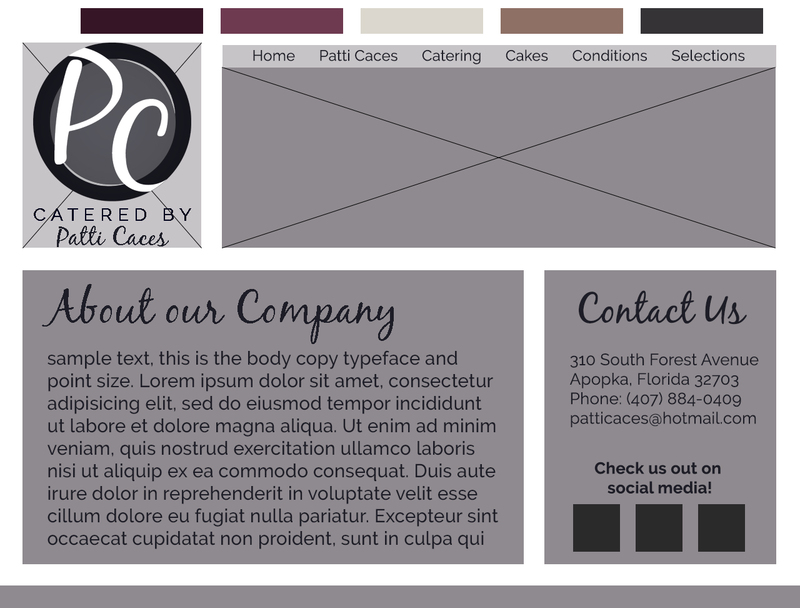 Another article describes that positioning “ensures that marketing messages resonate with target consumers and compel them to take action.” I positioned Patti Caces as an established, elegant brand. My communications strategy aims to convey the values of responsibility and quality behind Patti Caces in a consistent way that will aid the brand as it continues to expand. A logo is the main centerpiece of a brand and is the most recognizable item for consumers. In creating the Patti Caces logo, I wanted to make something that clearly conveyed the brand identity and the purpose of the brand. Since Patti Caces’ main service is catering, I designed a circular logo in the form of a plate. The initials of the logo stand out the most on the actual plate, and the full name of the company and slogan are located beneath. I did this so that the plate could stand alone if necessary; however, the full name is present on most of my designs because I think it is important for brand recognition. The slogan does not appear in my designs, but could be kept with the logo on other materials if deemed necessary. When creating my banner ads, I wanted to design something that Patti Caces could use for a variety of purposes. I kept them general so that they could easily be placed on any website. These logos would redirect back to the main web page when linked, which is detailed further down. Because the summer season is approaching, I wanted to create a social media campaign that Patti Caces could use to capitalize on this time of year. 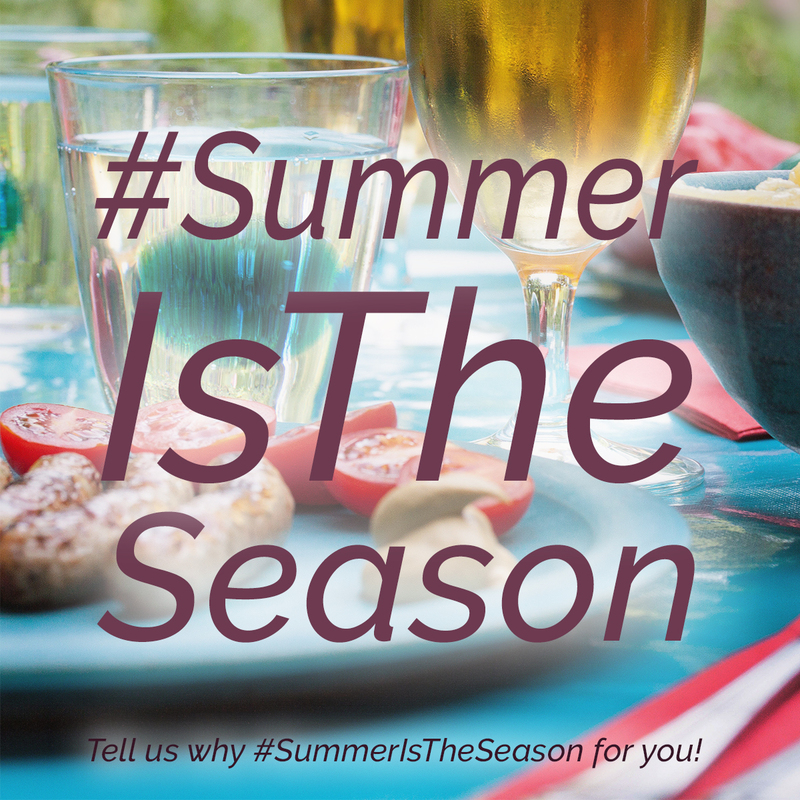 I created the hashtag #SummerIsTheSeason to use across all graphics, which began with my idea to use the concept of “summer is the season for weddings” as the purpose of the dedicated email, which you will also see further below. I felt that promoting for wedding services on general social media made more sense than attempting to communicate solely with production companies, but I made sure to include graphics that could appeal to anyone looking to cater an event. Although Patti Caces does not currently have a Twitter or Instagram account, I think that moving onto these platforms would be beneficial for future expansion. The dedicated email is based around the concept of “summer is the season for weddings.” Summer is a popular time of the year for marriages, and so I wanted to push this in the email. Social media, email, and banner ads are useful in creating exposure for Patti Caces, but they all must link to one central hub. The wireframe establishes the basic layout design for the website, which is the focal point of the online presence. From here, visitors can get a feel for the brand and navigate to the information they’re looking for. The image panel, shown here with a couple on a wedding cake, can be rotated to feature multiple aspects of the company’s services. Beyond the materials I have so far designed, Patti Caces has several opportunities to further expand their IMC campaign. All of the pieces above are digital. Although digital communications are becoming increasingly important, print is most certainly not dead, and having unified communications across both channels is vital. Patti Caces can move into newspapers, magazines for weddings, local happenings and film production, and can take advantage of direct mail marketing to send materials straight to consumers. 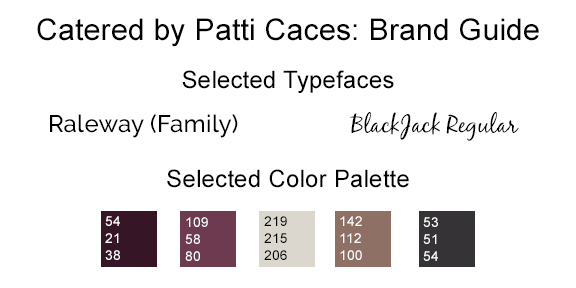 Consumers who subscribe to an email list could also subscribe to a direct mailing list if they want to learn more about what Patti Caces has to offer. This would be particularly beneficial for those planning a wedding or who may be in need of repeating catering services. Another fun way to expand IMC would be to create t-shirts for the catering team to wear when they go to events. Though this may not be appropriate for weddings, having this extra branding at corporate events or on film production sites would not only increase how often all attendees see the name of the brand, but also would help to give a unified, professional feel to the company. Overall, I thoroughly enjoyed creating this IMC campaign for Catered by Patti Caces. After looking at the brand’s original communications, I knew it would be a challenge to start an entire brand presence from scratch. However, after doing some preliminary research, I also knew it would be a fun project to work on. Patti Caces provides quality service to its clients, and so it was exciting to create my own designs for an established brand. By working through this process, I discovered what it was like to create work for a real client and pushed myself beyond my past design limits. Disclaimer: I am in no way affiliated with the AAA company and this is for solely educational purposes. 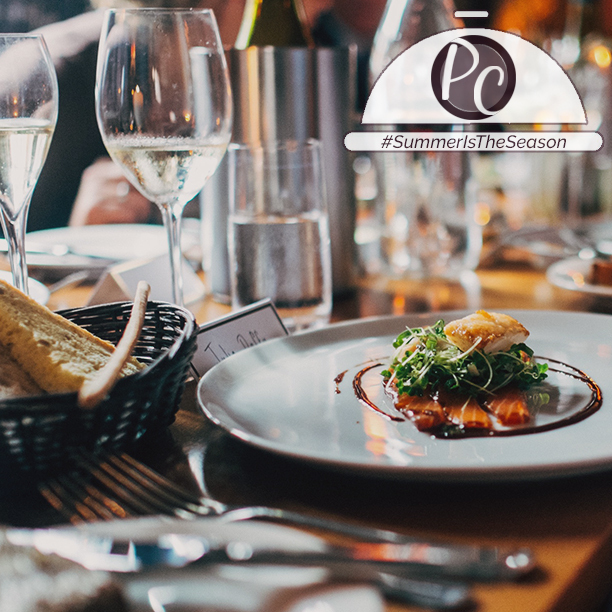 The summer months are quickly approaching, and now is the time for brands to begin preparing for the excitement and warm feelings associated with summer. Since so many travel companies get the most business during this time of year, this week I was assigned to select a company within the travel industry and create new social media graphics for them to use. My family is a big fan of the American Automobile Association, so I chose them for my campaign. 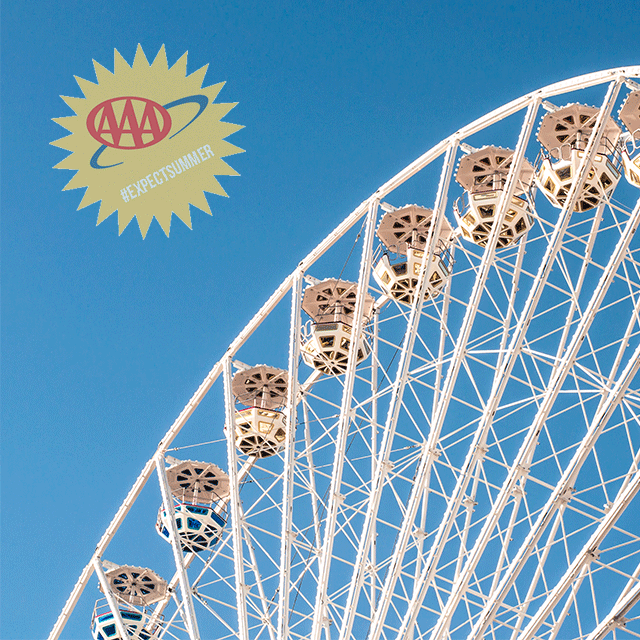 AAA began as a company with “the purpose of lobbying for driver and passenger rights, fair laws and safer vehicles — all to better promote the love of the open road and the adventure of driving.” Since then, AAA has expanded to also provide roadside assistance, insurance and travel accommodations for members. I wanted to focus my campaign on the travel aspect of their company, encouraging members to use AAA’s services to plan a summer trip. I created three Facebook cover photos that the company could alternate between throughout the summer months. On the company’s website, you can find the slogan “Expect Something More.” I wanted to incorporate this into my designs and portray a variety of environments where members could vacation to. I also wanted to evoke emotion, creating a desire for travel. Along with the cover photos, the rest of the Facebook page must also convey the same feel. The profile image should be kept as the simple logo, but posts should pertain to summer travel. The brand could highlight weekly travel spots to promote their deals, keeping with the “expect ______.” theme. Bringing this idea over to Twitter, I also created a cover photo for the company’s profile. Though their Twitter is primarily focused around driving news and facts, the company could use this image if they decided to change their focus for the summer. AAA has a presence on most forms of social media. However, the company actually does not have an official Instagram. I think that creating one would be beneficial for the company, especially if they used it to feature travel destinations. They could also use it to promote driving facts and new information. I created a sample image, using an overlay that the company could use to brand their summer campaign. To keep all imagery consistent, I made sure to place the logo on all materials and always use the same font, Bebas Neue Regular. I also used sunny, fun and attractive imagery. The hashtag I created, #ExpectSummer, could be used on Instagram and Twitter. As for another social media channel I would recommend, I would choose to implement a company Tumblr. The company does have a travel blog, but it is a bit outdated and disorganized. A company’s Tumblr seamlessly blends in among regular user posts, and AAA could use one to create a revamped travel blog.